We begin the second leg of our travels with a slight deviation towards the Southern Lakes. This is the playground of many kiwi families during the Christmas and new year holidays. 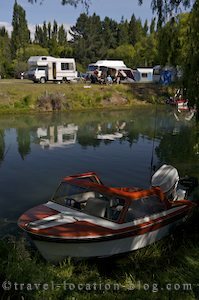 Lakes Waitaki, Aviemore, and Benmore are particularly popular for water sports such as water skiing, fishing, boating, and swimming and the campgrounds are chocker block with caravans, campers, and tents of every possible shape and size. Some families have obviously planned to stay quite a while, having brought everything except the kitchen sink and we mean everything - even the two pet birds in their bird cage. Plus as we explained in a previous blog, there are extended family communities set up with windbreak fences creating small backyards full of camp chairs and tables. We camped the night at the Otematata Boat Harbour and Campground on the shores of Lake Aviemore and enjoyed watching the comings and goings of people.